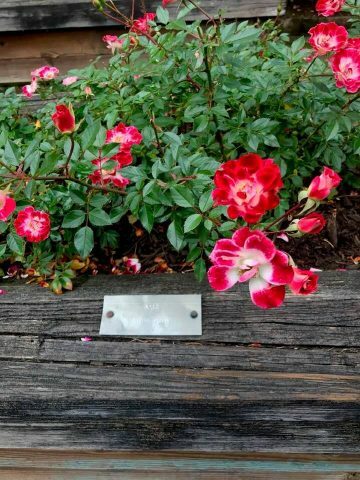 We were at the Portland International Rose Garden recently and saw this rose and if you look really closely the name on this rose is Little Artist and I was intrigued both by the physical beauty and style and color and smell of the rose and also by the name of the rose. And I thought, when children are little, they are little artists and they love to create art, and I think we should always treasure that. Unfortunately, when kids grow up they begin to become critical of their art work, or teachers and others are critical of their art, and so they think they are not any good at art and they stop creating, and that is sad. Art to me is hugely important. We should value it, we should appreciate the arts, and what the artist does, and acknowledge what the purpose of the art and the artist is. Growing up, my parents put an emphasis on art. We grew up with classical and baroque music being emphasized. I played the violin starting in fourth grade as did my sister. My dad played the cello. And, my parents played classical music and opera records in the background all the time. And, they took us to symphony concerts in downtown Portland which we got all dressed up for. They dragged us (yeah, that was pretty much it) to the opera. They talked about art and artists. And, as my brother and sister and I got married and started our own families, my parents continued to take us to live music events with us and our children, sometimes all of us together. I remember one time they invited us all to the halls of the Portland Art Museum where there was an art exhibit featuring old German art. Yep, because my folks are immigrants from Germany much of the art we spoke about and learned about and experienced was created by German artists. Painters, musicians, and of course Germany has a rich history of art. And opera, that was also in Italian of course. What does art do? It opens up our lives to wonder. It notices. It appreciates. It widens our world. It reaches a different part of the brain. It celebrates beauty and the ordinary everyday awe in which we find ourselves if we would just stop and notice. Raising our kids to appreciate art and acknowledge the place of artists and the importance of the arts matters. Also, not just appreciating art by observing it but also by participating. Children are naturally artists. Until someone tells them they are not good enough. Our kids took piano lessons and art classes and sang in choir and played other instruments like the trombone and guitar and the saxophone. I hung pictures that my kids painted on the walls and on our fridge and we attended all of their concerts and invited the grandparents along. We tried continually to show the importance of art and continue to. Now, as my kids have gotten older, they continue to appreciate art in their lives. My twins started playing guitar on their own and they attend concerts and just love music. 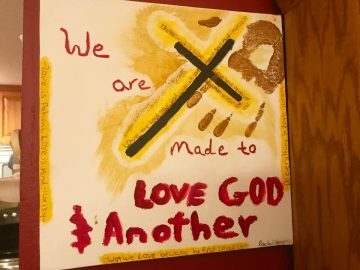 In high school they took sculpture classes and my daughter took art class and she continues to paint and write. We display this art work of hers in our dining room. Art. Appreciating Art and the Artist is my 19th post in my 30 Days of November How I Mom blog series. Into the pond a frog jumps. It is perhaps the best known of all Japanese haiku. No subject could be more humdrum. No language could be more pedestrian. Basho, the poet, makes no comment on what he is describing. He implies no meaning, message, or metaphor. He simply invites our attention to no more and no less than just this: the old pond in its watery stillness, the kerplunk of the frog, the gradual return of the stillness. In effect he is putting a frame around the moment, and what the frame does is enable us to see not just something about the moment, but the moment itself in all its ineffable ordinariness and particularity. … the frame sets it off from everything else that distracts us…it changes our way of perceiving the moment. It makes us notice the moment…It is what literature in general wants above all else too. From the simplest lyric to the most complex novel and densest drama, literature is asking us to pay attention. Pay attention to the frog. Pay attention to the west wind. Pay attention to the boy on the raft, the lady in the tower, the old man on the train. In sum, pay attention to the world and all that dwells therein and thereby learn at last to pay attention to yourself and all that dwells therein. Unlike painters, who work with space, musicians work with time, with note following note as second follows second. Listen! say Vivaldi, Brahms, Stravinsky. Listen to this time that I have framed between the first note and the last and to these sounds in time. Listen to the way the silence is broken into uneven lengths between the sounds. . . Listen … The sounds of the earth are like music . . . Listen to the voices outside the window, the rumble of the furnace, the creak of your chair, the water running in the kitchen sink. Learn to listen to the music of your own lengths of time, your own silences. Literature, painting, music–the most basic lesson that all art teaches us is to stop, look, and listen to life on this planet, including our own lives, as a vastly richer, deeper, more mysterious business than most of the time it ever occurs to us to suspect as we bumble along from day to day on automatic pilot. In a world that for the most part steers clear of the whole idea of holiness, art is one of the few places left where we can speak to each other of holy things. Is it too much to say that to stop, look, and listen is also the most basic lesson that the Judeo-Christian tradition teaches us? Listen to history, is the cry of the ancient prophets of Israel. Listen to social injustice, says Amos; to head-in-the-sand religiosity, says Jeremiah; to international treacheries and power plays, says Isaiah; because it is precisely through them that God speaks his word of judgment and command. And when Jesus comes along saying that the greatest command of all is to love God and to love our neighbor, he too is asking us to pay attention. If we are to love God, we must first stop, look, and listen for him in what is happening around us and inside us. If we are to love our neighbors, before doing anything else we must see our neighbors. With our imagination as well as our eyes, that is to say like artists, we must see not just their faces, but the life behind and within their faces. Here it is love that is the frame we see them in. Cornelia, I love how you wove the beautiful rose called Little Artist into the fabric of this post. What a legacy you and your family have gifted others with in the arts! Reading this stirred up creativity in my heart. My kids are now grown – 24, 28, and 30. My daughter wants to take up violin, and she paints every Thursday. My two sons love music – one as a drummer in a rock and roll band in Tokyo, and the other singing from a stage in theater. I think playing music, while they were children, put a love for music in them…today my favorite is (cheesy, I know) barbershop quartets.